Once upon a time there was a Dungeon Keeper game that everyone loved. It had no arbitrary timers, no microtransactions, and it's mere mention did not cause spontaneous vomiting. Today through Sunday, that Dungeon Keeper is free on Gog.com. Can you feel the love? Classic gaming hub Gog.com is celebrating Valentine's Day weekend with a lovely little sale, at the forefront of which is a free copy of Dungeon Keeper Gold for everybody. You get Dungeon Keeper Gold. You get Dungeon Keeper Gold. I get Dungeon Keeper Gold, eventually. 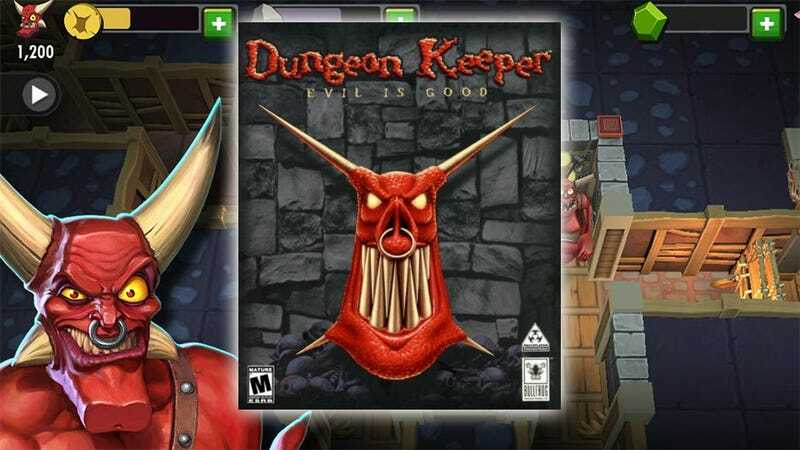 Dungeon Keeper Gold includes the 1997 classic strategy game that inspired recent miseries, along with the Deeper Dungeons expansion pack, 3D graphics support (oooo) and all sorts of extra goodness. Those of you new to the franchise be warned — the game only runs on PC and Mac, not your tablets or phones. How barbaric, right? Along with the low price of free for the original game, Gog.com also has Dungeon Keeper 2 on sale for $1.49. Now before this special deal whips us all into a celebratory anti-EA dance party, read the official deal announcement from Gog.com's forums. For the next 48 hours Dungeon Keeper Gold (complete with the Deeper Dungeons expansion) can be added to your GOG.com account for free! If you already own it on GOG.com, you can still get one extra gift-code for the game and present it to your significant other gamer, or a friend. See? Electronic Arts does still love the old-school Dungeon Keeper fans. Just not enough for a proper sequel, and not as much as the casual mobile market. Happy Valentine's Day, everybody!